Member of the prestigious circle of Haute Couture Ms. Mori was the first woman to initiate the East to the culture of luxury and Western beauty in the greatest respect for its origins. Faithful to her Haute Couture requirements Ms. Mori has imposed the rare materials and noble flowers in her creations to offer genuine perfumes "hand-sewn" and olfactory world in the image of his artistic approach. It is in total freedom and uncompromising with exceptional fragrance imagines. The raw materials are words, colors, musical notes, we must seek to create a melody, a story, an emotion. Hanae Mori - 1926 Her childhood: Hanae Mori was born in Shimane, small provincial town near Tokyo. Her mother, a housewife, raising her children in the pure Japanese tradition. Her father is a surgeon with a very pronounced taste for literature, sculpture and fashion. Her childhood the so submits to the double influence of the modernism of her father and the tradition of her mother. Hanae Mori - 1940 Paris: She carries out literature at the Sorbonne in Paris in the Roaring Twenties. Hanae Mori - 1951 Her mission: Influenced by her father and very pronounced taste for sculpture and fashion, Hanae Mori embarked on studies of design and sewing. She opened her first shop in Tokyo. Hanae Mori - 1954 Recognition: She imposes her creations among directors of Japanese cinema and soon considered one of the best costume designers. In 1960, more than 700 creations, she received the award for "Japan's Editor's Club" and became "the" woman vanguard that best symbolizes the dreams of emancipation and achievement of Japanese. Hanae Mori - 1977 Inauguration: With her dual culture, Ms. Hanae Mori inaugurated her first Haute Couture collection and hugely successful. Passionate, diligent, her peers confirm her talent and invited him to become a member of the Chambre Syndicale de la Haute Couture Parisienne. : Since the departure of Yves Saint Laurent, the houses with the Haute Couture label are 10 in number: Torrente, Dior, Chanel, Lacroix, Ungaro, Scherrer, Givenchy, Balmain, Jean Paul Gaultier and Hanae Mori. Hanae Mori - 1978 Fashion Show : "The best Six 1979" is organized for the first time to promote fashion in Japan. The selected designers are: Thierry Mugler in Paris, Stephen Burrows New York, Gianni Versace in Milan, Jean Muir for London and Issey Miyake and Hanae Mori in Tokyo. 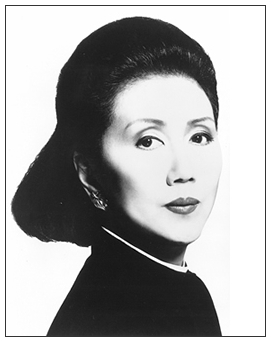 Hanae Mori - 1983 Icon: Ms. Mori created the "Foundation of Fashion" which aims to promote Japanese designers worldwide and give Tokyo the title of fashion capital. Hanae Mori - 1989: She is decorated with "The Cross of Chevalier of Arts and Letters" and the "Legion of Honor" in Paris. Hanae Mori - 1992 Opening of her first boutique in Paris Place de l'Alma: Already established on the most beautiful avenue of Tokyo she opened her first shop in Paris in the heart of the Golden Triangle (bounded by Avenue Montaigne Avenue Marceau and the Faubourg Saint Honoré), the haunt of fashion and elegance. Hanae Mori - 1993 Ready-to-wear: She launches her line of ready-to-wear luxury "Cashmere & Weekend" dedicated to cashmere, symbol of luxury, comfort and femininity.